This weekend the Premier League returns with important fixtures that will might be decisive in the championship development. Leicester is getting closer to achieve an historical objective: Winning the Premier League. However, it will have to beat Crystal Palace that is trying to prevent relegation. Chelsea is going throught a terrible moment and its last hope this year is to get the UEFA Europa League position which is actually taken by West Ham. Watford who is one of the FA Cup semifinalists will play against Stoke City . Finally, Norwich City needs urgently the victory against West Bromwich to come out of relegation positions. 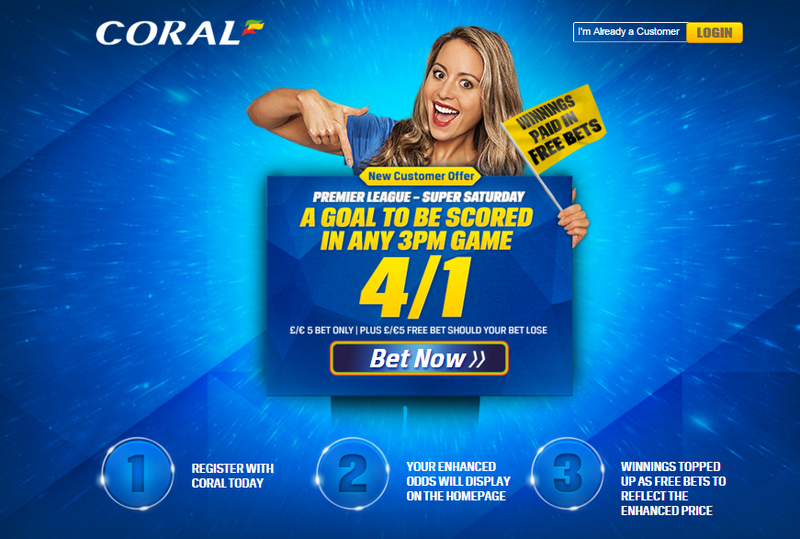 As always, Coral wants you to make money while enjoying the best English football. Do you think that any goal might be scored in any of the 3 pm Premier League fixtures that will take place on saturday? If your answer is yes, this Super Saturday Promotion is for you! Open a new Coral online or mobile account. Place a sigle bet of £/€5 on ‘A goal to be scored in ANY 3pm game in Premier League on Saturday – 4/1’ in “My Markets” section. But this is not all! If your bet wins, you will be paid in cash. Moreover, if your bet loses, you will receive £/€5 in free bets on settlement of the market! As you can see, getting this promotion is very simple. Do not miss this great opportunity to make money with Coral while enjoying the Premier League! It is important to highlight that this offer is only available to UK & Republic of Ireland residents. Accounts registered via any other source than mentioned do not qualify. Remember that this offer is £/€5 bet only! Besides, this 31 Premier League matchday brings us a new exciting Manchester Derby. Although both teams are not candidates to win the Premier League, both of them need to take urgently the victory to try to get a Champions League position. Beating the eternal rival will suppose an injection of moral for the winner and an emotional blow for the loser. 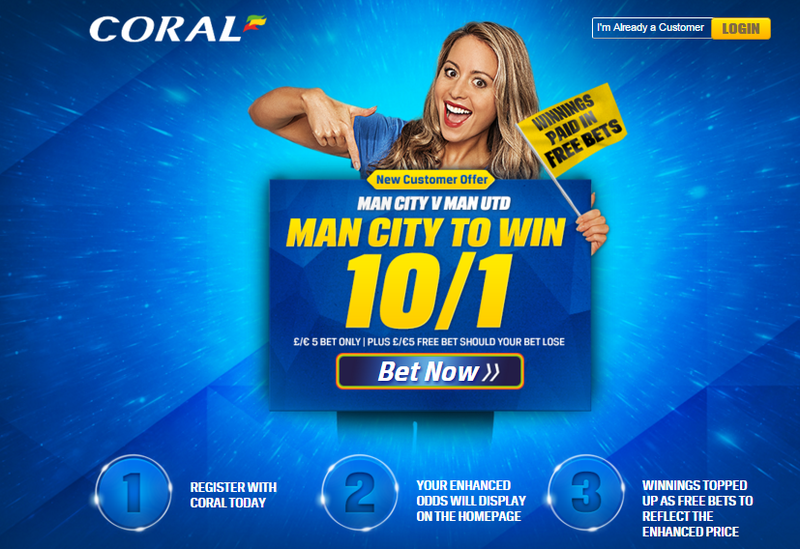 Coral offers its new customer a great promotion to bet on Manchester City to win with a extraordinary odd of 10/1! Are you interested? Getting this promotion is very simple and you only need to follow the steps bellow. Place a sigle bet of £/€5 on ‘Man City to win against Man Utd – 10/1’ in “My Markets” section. But this is not all! Coral will give you a stake of £/€5 in free bets to keep betting if your bet loses! So as you can see you have nothing to lose!! Do not miss this great opportunity to make money with Coral while enjoying the Manchester Derby! Remember that this offer is only available to UK & Republic of Ireland residents. Accounts registered via any other source than mentioned do not qualify and that this offer is £/€5 bet only!